Noise and shapes can spook or attract dogs and need to be considered distractions in their own right. If whatever happens causes a trailing dog to disengage from the scent trail of the subject, it is a distraction. I have often heard handlers tell me that their dog has a certain attraction or fear reaction to a certain “thing,” and they take it for granted that it is a problem. Rather than trying to fix it, they attempt to avoid the problem or let the problem shut the dog down. This is a bad habit and does nothing more than reinforce the reaction in the dog. If the dog realizes that the handler will give in to an attraction nor give up when the dog encounters something about which he is nervous, the distraction becomes stronger each and every time this happens. There will come a point at which the handler may not be able to correct it. As with the kitty, the attraction or phobic response should be dealt with immediately and never be reinforced by allowance. Here’s another example using my own dog. For some unknown reason, my dog freaked out when he heard the crash of a trash-truck dumpster putting a load of trash into the bed of the truck. I have no idea why, and I do not remember a particular incident that triggered it the first time, but I am now convinced that it had happened before and that something I did reinforced the fear. I know this now after working with hundreds of dogs. Ronin was my first dog, and he was wonderful for me because he provided the basis for everything I did then and for what I am now. I am now intensely watchful of any dog’s body language at all times that I am with him. If the dog is for work, I am doubly watchful. The only way I learn about a dog’s attraction or phobic response to an animal or object is through his body language. There is no other way, because the dog cannot speak to me. I am charged with the duty to be cognizant of what affects the dog. My job is that of an interpreter, motivator, and leader. When I finally recognized the problem regarding the trash truck, I had to take countermeasures to solve it. First, I needed to make my dog realize that I was not afraid. I am the perceived leader, and if the dog thinks that I am afraid based on my odor of physical reaction will be equal to or exceed my own. With my behavior, I affect what and how my dog responds to situations. If I am a rock in a stormy sea of stimuli, my dog will be easier to deal with. I showed Ronin that I was not afraid; I approached a truck confidently and with no hesitation. Second, I used motivation and reward (food) to coax him in close. This took time, but I got Ronin to the point that he could trail right past a trash truck and not give it a second glance. The reward can be anything the dog likes such as a ball, tug, or praise. Ronin was a walking stomach, and food was the key to everything. The worst thing to do is to coddle! A handler should not coddle his dog when the dog is scared. What I mean by coddling is, when the dog shows a fear reaction, the handler reaches down and pets and fawns over him, cooing sweet nothings into his ear. This behavior reinforces the fear because, in reality, the petting and cooing are telling the dog that he is right to be afraid of what he is balking at. Dogs are not children, and they do not rationalize things the way people do; stroking and “rewarding” fear behavior tells the dog that his fear is well founded. The best way for a handler to correct his dog is to firmly say “no,” confidently walk up to the “thing,” inspect it with no fear, and then motivate his dog to come over. If it takes six months to fix this situation, so be it. From K-9 Trailing: The Straightest Path, by Jeff Schettler. Published by Alpine Publications. For more information or to order the book, please visit K9 Trailing: The Straightest Path. 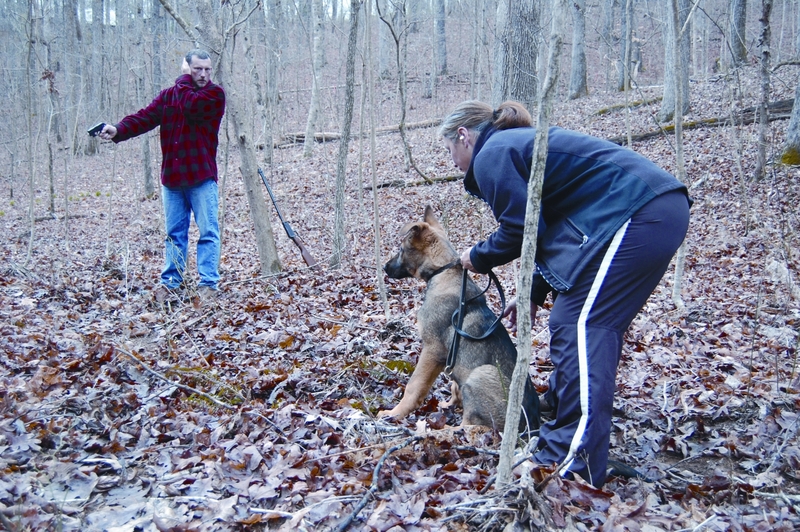 This entry was posted in tracking dogs and tagged distraction training, dog training, noise detractions when training dogs, object distractions when training dogs, object distractions when training tracking dogs, object distractions when training trailing dogs, training dogs, training the tracking dog to stay focused, training the trailing dog to stay focused. Bookmark the permalink.